From a food standpoint, Christmas Eve started off badly. In short, I committed the cardinal sin of farmers market shopping – making a list. I think I’ve mentioned before that I am able to purchase roughly 70% of my weekly groceries at the Vista Farmers Market – one of the best markets in North County. The rain or shine market is typically held on Saturday, but because Christmas was on a Saturday this year, the organizers opted to open it on Friday – Christmas Eve – instead. I appreciate this for a number of reasons. I buy all of my produce and most of my meat, eggs, fish and specialty items at the market to not only support local farmers and the local economy, but because, frankly, they just taste better, fresher. I had planned an entire eight-day menu around the ingredients I typically find at the market. The key word here is typically. While I am a die-hard rain or shine farmers market shopper, (and I’m not alone in this,) unfortunately some of the farmers and vendors aren’t. I understand that they also are entitled to spend holiday time with their families so I can’t begrudge them that, but it also really messed with my menu which included fresh scallops, sausage, shallots, goat cheese, walnuts, honey, jam and more. I was only able to purchase about 20% of the ingredients on my farmers market list (I split my grocery list in two – farmers market and grocery) which meant that the rest of the items were going to have to come from the grocery store. (I wasn’t about to start running all over town on Christmas Eve.) So, my morning of shopping (which I usually enjoy) got off to a crummy start and I don’t think my day ever recovered. I did learn an important lesson in availability, though. While I fully support a smaller, more local economy, sometimes reconciling that fairly new way of thinking (for me,) with my ingrained “get-it-anytime-you-want-it” materialism is tough. And this year my Christmas menu was the casualty. Which leads me to Christmas Eve dinner. 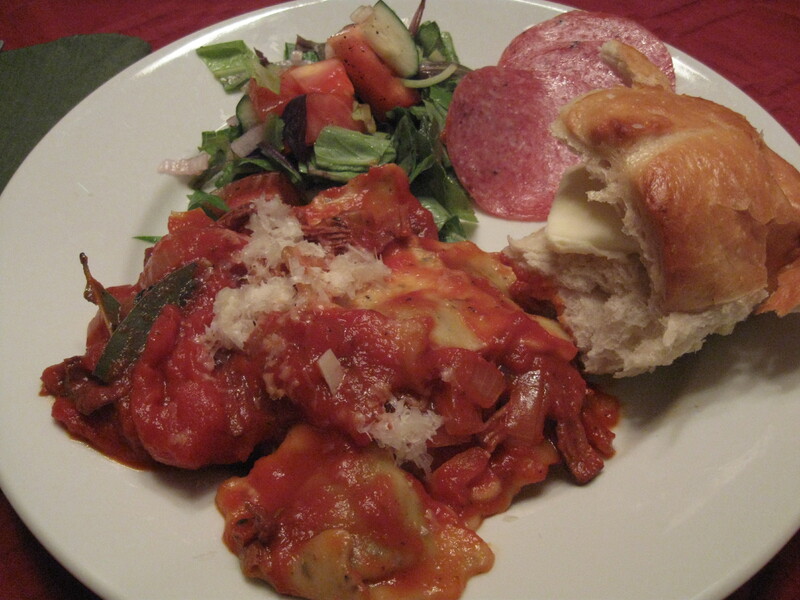 This year my mom requested a dinner “like I used to have as a kid.” Having grown up in the San Francisco Bay area in the 40’s and 50’s, a traditional dinner was fresh ravioli, home made pasta sauce, sourdough garlic bread, an antipasti platter, fresh sliced salami and green salad. I tried and failed to deliver the dinner of her childhood. Because I wasn’t able to buy my fresh pasta at the farmers market, I ended up with the refrigerated version from the grocery store. The sauce we made was bland and too tomatoey – although I did use dried chantrelle mushrooms from the farmers market which added texture, but not taste, to the sauce. The bread was not San Francicso sourdough and I wasn’t really sure what my mom was looking for in an antipasti platter so I just deleted that entirely from the menu. And I thought she just wanted the sliced salami from the package. I was wrong. She meant the fresh stuff – thinly sliced and full of spices. Finally, the green salad, (the ingredients being mostly out of season,) was mushy and bland. Meh - Christmas Eve Dinner, The boring version of the dinner I wanted to make. All in all this dinner was not what I would consider one of my most successful Christmas Eve dinners. We were too tired. The food was too bland. Madison wasn’t around. And the cheesecake I made for dessert never even made it too the table. A few days later we were looking through cook books for New Years Eve recipes when we came upon an examples of an Italian dinner, she showed me the dinner and said ‘ this is probably what you were looking for right?” It was… She was forgiven though, because she pulled some good dinners out of her hat in spite of the lack of really fresh ingredients. Thanks Heather.